Targeted Facebook adverts, sponsored posts (boosted posts), on the world’s largest social media channel where nearly two-billion people worldwide are active, is a suitable marketing channel for many local Perth businesses to focus their advertising spend as this is where many of their own audience actively participates. Recommendations from friends and family on Facebook have been shown to influence 72% of online shoppers in their buying decisions. Search Group manages the Facebook Advertising management process for your business, setting up the Facebook Ad account, creating Ad Groups, designing the Ad creatives, carefully selecting targeting options based on demographic profiling matching your intended audience persona, setting the target location, managing bid amounts and campaign optimisation with effective A/B multivariate testing, configuring the Facebook tracking pixel for conversion tracking through to your website so that we can measure the effective Return On Investment (ROI) of your online advertising campaigns. Facebook business page advertising can be done for Facebook wall content sponsored posts, image/video posts, events, apps, products, notes as well as specific side panel advert placement. Search Group can also assist your business with the creation of a Facebook Business Page, optimising your Facebook page, content creation and strategy, as well as monitoring and managing your Facebook page for your business. We can integrate shopping carts, email newsletter subscriptions form, custom pages, apps and other social media channels into your Facebook page. 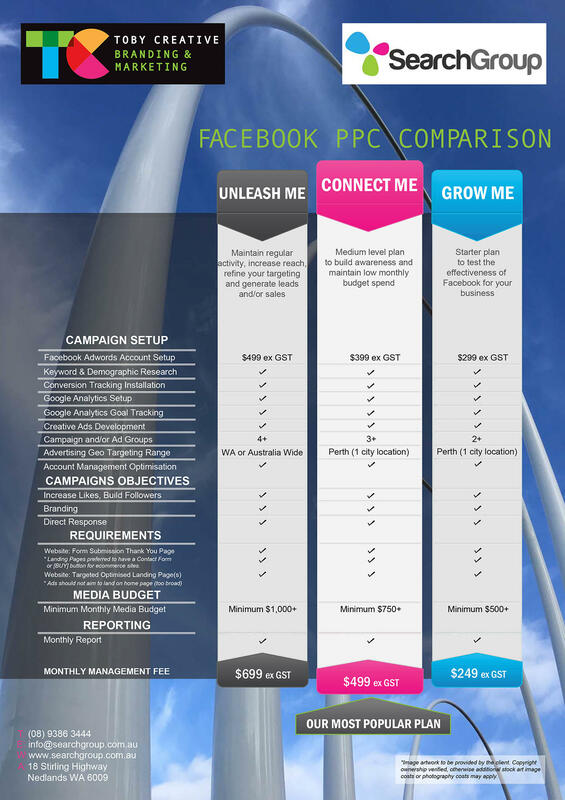 Download or print-out, our Search Group Facebook PPC brochure, then either call us on (08) 9386 3444 to book a no obligation free initial consultation at your location so that we can discuss your specific requirements, or fill in our contact form on this page to send us your details and we’ll contact you back. Ask for our FREE website SEO report to find out the current status of your website and which areas can be improved.